This book of creative nonfiction shares the natural and cultural history of the place on Cook Inlet, Alaska, where Nancy and her partner, Ken Castner, commercially fished for salmon beginning in 1979. Nancy says, "When people ask me which of my books is my favorite, I have to say Fishcamp. It's the most memoiristic of my work, and the book closest to my heart. At the same time, it's not about me; it's my intent, in telling stories from the place I know best, to ask readers to consider with me the bigger questions about how we live in the world and what responsibilities we have to our histories and environments." From the preface: "Commercial fishermen are among the lucky few who are privileged not just to visit wild places but also to participate in the life of those places, to live in relationship to other creatures and to mystery. Even in Alaska we're very likely anachronisms, doomed to pressures from fish farming, competition from sport fishermen, and habitat destruction. And yet it seems to me that the best chance for humans to regain a healthful connection to the earth, seas, and air will come not from worshipful distance but from the authentic integration of life and work that's known on fishing boats and beaches and in woods and fields. I'm speaking not of exploitative, industrialized work but of personal, sustainable work that's responsible to place and others, the kind that's part of a larger whole." "In describing her salmon-fishing life along Alaska's Cook Inlet, Lord fashions a rich, personal cosmology in prose as fluid as her environment. . . To her credit, she doesn't browbeat readers with her lifestyle, doesn't get righteous, but wears her experiences lightly and with telling effect. Her book is written in the descriptive mode, broadly curious. . . Lord creates an elegant, evocative portrait of a hard, beautiful place." "Fishcamp brings the news from a nearly forgotten world, and it's news the reader is glad to get. Lord's writing is spare and completely without affectation. There is nothing ghostly or sentimental in her pose, only the effort to account for what make her life worth living." 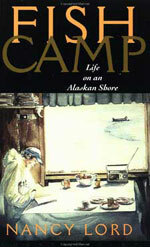 Fishcamp was nominated for the John Burroughs Medal for distinguished nature writing and was also selected as one of the top ten nature/environment books of 1997 by amazon.com. After years of depressed prices, 2013 saw a rebounding of salmon prices to near-records, and Cook Inlet continues to produce good numbers of salmon for commercial, sport, subsistence, and personal use fishermen. Although Nancy is no longer commercial fishing, she still loves a fresh fillet or a hard-smoked salmon strip. She's greatly concerned about habitat destruction from a proposed coal mine in Cook Inlet and the proposed copper and gold mine, Pebble, in Bristol Bay. The book cover pictured, from the paperback version, is from a watercolor by Homer artist (and Nancy's friend) Susan Phillips Cushing. The painting is one in a series of women and fishing.